(RxWiki News) Mammograms can help detect breast cancer at an early stage. That means they can lead to early treatment, which can save lives. Early breast cancer treatment can increase the chance of survival. Here is everything you need to know about mammograms during this Breast Cancer Awareness Month. A mammogram is an X-ray picture of the breast. It is the best way to detect breast cancer early. Another equally important exam is the regular breast self-check. These self-examinations can help women detect breast cancer earlier. Read Detecting Breast Cancer Early for steps on how to conduct a breast self-exam. Your doctor may also perform a clinical breast exam, which is when he or she uses his or her hands to feel for lumps or other changes in the breast. Get a mammogram every two years if they are between the ages of 50 and 74 and are at average risk for breast cancer. Talk to their doctors or other health care professionals about when to start screening and how often to get a mammogram if they are between the ages of 40 and 49. Your doctor will go over the benefits and potential risks of screening tests. If you want to be screened, call your gynecologist's office. He or she can help you schedule an appointment. Most insurance plans cover mammograms every one to two years for women age 40 and older. If you are worried that you cannot afford a mammogram, see if you qualify for low-cost screening made available by the CDC’s National Breast and Cervical Cancer Early Detection Program (NBCCEDP). A mammogram is uncomfortable for most women. Some even find the experience painful. The good thing is that your mammogram will not take too long to complete. 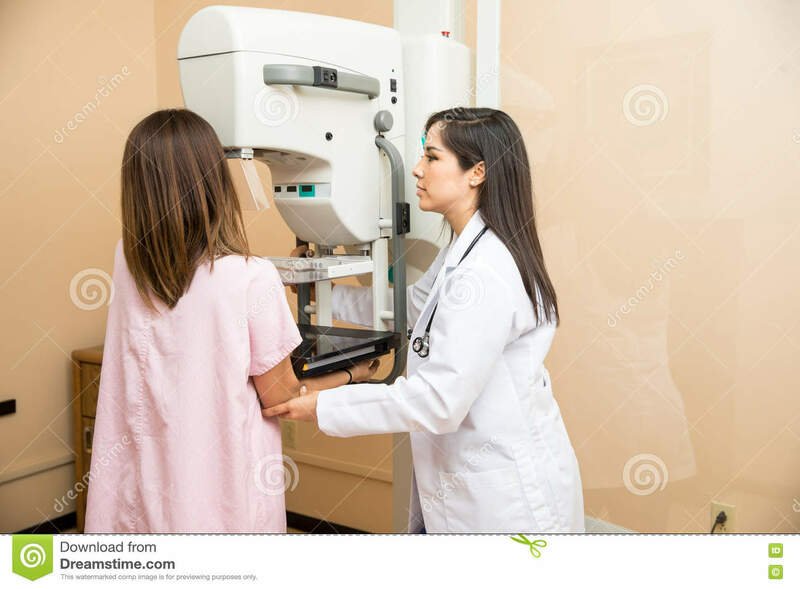 Your mammogram will be read by a radiologist. It may take a few weeks to receive the results, although this depends on the facility. If you do not get your results within 30 days, contact your doctor or the mammography facility. Remember that an abnormal mammogram does not always mean cancer. If the results show an abnormality, you may need to have additional mammograms, tests or exams before your doctor will know for sure. Schedule your mammogram around your period. Avoid having your mammogram done the week before you get your period or during your period. This is because your breasts may be more tender or swollen during that time. Do not wear deodorant, lotion, perfume, or powder under your arms or on your breasts on the day of your mammogram. These products can show up as white spots on the X-ray. You will need to undress from your waist up for the mammogram. It may be better to wear a top with a skirt or pants instead of a dress. Let the staff know if you have breast implants. In this case, they may need to take additional pictures. Bring prior mammograms to the clinic or have them sent to the center, if possible. Tell the staff if it is difficult for you to sit up, lift your arms or hold your breath. Talk to your doctor if you have any questions about breast cancer or screening.